Moving indoors this week. Happy Hour is back! Patty Schwartz of Back Acres Farm will sell her farm produce indoors starting this week. Back Acres Farms and Shadeau Bread are moving indoors to the College Hill Coffee Co. this week. Drop into 6128 Hamilton Ave. (at North Bend Rd.) any time from 3:30 – 5:30 pm every Thursday. Happy Hour for the market returns: half price beer and wine by the glass from 4 – 6 pm. Our Harvest Cooperative will distribute weekly Harvest Boxes in the parking lot behind the coffee shop. In the photo above, Patty Schwartz of Back Acres Farms displays her wares at our last outdoor market of the season. She and husband Jim produce an amazing variety of foods that can have you happily eating local through the winter. Items like homemade potato chips, sweet potato chips, assorted canned items, butter, Greek yogurt, ribs, chicken, eggs, goetta, noodles, buckwheat and spelt flour, garlic, onions and potatoes are often available. Depending on the weather, this week you may also find green beans, peppers, beets, lettuce, kale, winter squash and perhaps watermelon. You may also order a Thanksgiving turkey from Back Acres by signing up with Patty at the market and making a $20 deposit for each bird you order. 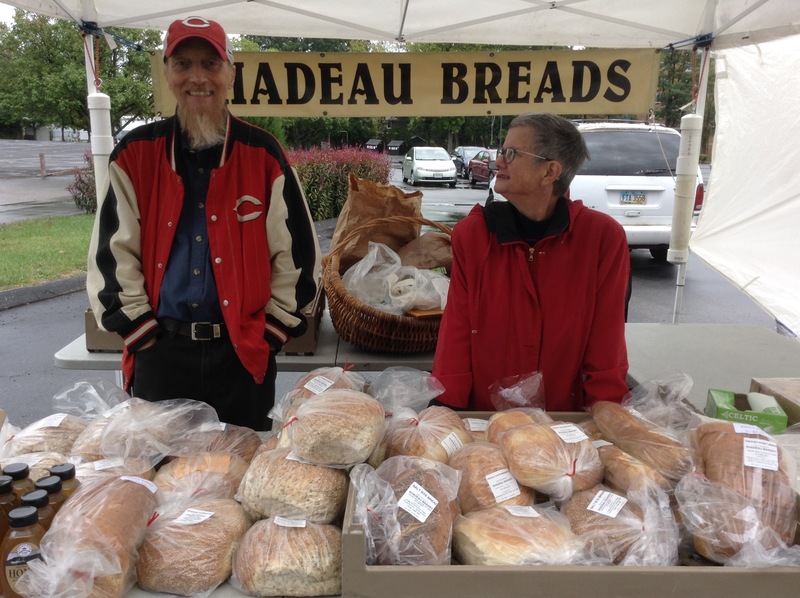 You will find Gary Skitt selling Shadeau Bread indoors at College Hill Coffee Co. beginning October 15. He carries local honey, too. This entry was posted in News and tagged Back Acres Farm, College Hill, College Hill Coffee Company, College Hill Farm Market, farmers' market, Grandola Granola, Harvest Box, local farm, local food, Our Harvest by College Hill Farm Market. Bookmark the permalink.